After sitting quietly enjoying the impromptu recital I struck up conversation and was informed by the ponytailed musician that he was rehearsing for a concert in St. Moritz the following day. The sun was setting, and across the valley the 4048m Piz Bernina sat majestically as the sky turned from bright blue to black via pink alpenglow. I’d only just arrived in the eastern Swiss Alps for a few days riding and was struck how engaged locals were with the environment. Why practice for a concert indoors when you can take the train up a mountain and do it while the sun sets over a 4000m peak? The outdoor option makes sense really, especially if a train is available to carry the tools of your trade. The original railway construction started in 1905 and finished in 1907, and on opening it was able to transport 1144 people along over 2kms of track at a maximum gradient of 56% to an altitude of 2456m; uplift that wasn’t intended for elegant visitors to enjoy a flow trail but to simply enjoy the view. Or practise a musical instrument. It was the first railway built in the Graubünden region with the sole intention of providing pleasure for tourists. In fact the region has a history of being at the forefront of tourism development. Although originally populated with peasant farmers, things changed 150 years ago when those with vision could see the opportunity to to develop tourism and hotels - remarkable when at the time there was no running water or electricity. As that economic development occurred, so did the quality of life of the locals, and every generation added to it. St. Moritz evolved into being the first winter resort in the Alps, having the first tourism office in Switzerland, the first European Ice Skating Championships and the first Bobsleigh run. And so on. On returning to the restaurant I found myself talking to a tall, dark haired and thoughtful Romansh local, Darco Cazin, who grew up in a mountain village with a population of 160 and only two other kids his age. If anyone ticks the box for mountain local it’s Darco. We talked local history, art, heritage and the importance of thinking outside the box. Indeed it was only late in the conversation that I discovered that Darco was the man behind much of the development in mountain bike tourism in Graubünden - a Canton that includes Lenzerheide, Davos, Laax, and Val Müstair. Indeed Graubünden seems to be leading the way in Switzerland for MTB tourism, and the progressive, joined-up approach could be considered one of the best in Europe. It’s reliable, and on time. Like the Swiss Railways. Having studied for a business degree Darco then started a PhD in Design Thinking in Barcelona. He didn’t submit a final thesis though, as the draw of the mountains was too strong. Here we have a cultured man who loves mountain biking, has a business degree and also the knowledge gained from studying design thinking. Design what, you may wonder. Design thinking is a method for practical, creative resolution of problems. Solution-based thinking with the intent of producing a constructive future result. It’s all very Swiss. It’s what’s behind the vision and efficiency of the Swiss Trail Ways. His wife’s family is also from the Engadine, and their children’s Grand, Grand, Grand Grandfather was one the visionary farmers who developed a hotel 150 years ago. “Why I’m developing mountain bike tourism? I see it as an opportunity for my generation to contribute to the legacy of life in the Alps. Mountain biking is a tool of our time.” Darco comments. He didn’t ride off road as kid, and in fact only took up mountain biking in his early 20’s when his mother fulfilled a dream and rented a 70 bed hotel in Santa Maria Val Müstair, the next valley over from St. Moritz. It needed guests. Darco took to two wheels as a guide which helped fill the hotel with bikers, realising in the process that there was a market for mountain bike tourism. As he took visitors to other areas of the Engadine, it became apparent that there was little foresight or infrastructure in place to support them, and that the destinations had no idea of mountain biking’s potential. Having called time on his studies in 2003 the time was right to set up a development company to advise on MTB tourism. Allegra Tourismus was born, and he soon picked up a project in Livigno. At first there was trial and error, but the approach to projects has evolved into a clear method covering not only consultation and design, but also trail construction, installing transport infrastructure and ticketing, hotel infrastructure, educating guides and regional marketing. Obviously a destination has a different perspective. Developing a destination involves having these three elements working in harmony. One thing the Swiss have in their favour is the network of legacy trails, paths and tracks that were built for other purposes - wars, smuggling, trading, farming and hiking. Yet mountain bikers are permitted to ride on them. The Engadine Valley alone has 700km of rideable hiking trails, Graubünden region having 17,000km. These legacy trails include technical high mountain single track and panoramic mid altitude trails, as well as a multitude of rideable valley bottom tracks. Through the ‘Trail Tolerenz’ system riders are encouraged to ride safely and with an understanding that they may meet other trail users. You can even buy small bells to hang off your pack so hikers hear you coming. These trails have been supplemented with purpose built flow trails such as the Corviglia Flow Trail above St. Moritz, which required helicopters and the logistics of getting equipment in to place in a big mountain environment. One big difference of course between hikers and bikers is that for a person walking the usual objective, and highlight, is to enjoy the view and attain a summit, with that occurring midway through their day out. Meanwhile, for a rider the peak experience is more than likely the descent so the highlight comes at the end of a trail. Successful projects always start with meticulous work in the planning, in the policy, in the politics, in other words in meetings with other stakeholders. In the Swiss Alps that involves farmers, hunters, local government and environmental organisations. Finding the common denominator is often the crux of any development, and it’s something the Swiss are very good at. As Judith Matloff points out in her excellent book ‘The War is in the Mountains’ Switzerland is a country made up of four cultures and language groups ( German, French, Italian and Romansh), in most places in the world this would result in disharmony and strife. Yet through dialogue, pragmatism and direct democracy aka endless referendums, the Swiss are able to work together. Once the planning process and consultation is completed, it’s all about the design and execution, bringing together professionalism mixed with art and experience. One of the key factors is that the trail design is based on discussion with riders, with the question always ‘What do we want to do, for whom, and where?’. Not surprisingly for someone who has a curious nature and a broad range of interests, Darco is always willing to learn, and in 2006 made a visit to the UK to checkout the trail centre scene. One thing the UK has that Switzerland doesn’t is single track trails that are accessible to a wide range of users, from the less experienced to experts. While our Alpine cousins have miles and miles of legacy trails, they’re often found on the higher slopes requiring either fitness or lift access, and can result in long days out. However learning can be a two way process and Darco is of the view that the UK can learn from aspects of the Swiss model, increasing the economic benefits of trail infrastructure, something that destinations in The Alps do well by integrating their whole offer. This can also be seen in the adoption of eBike rental which also opens up trail networks to riders recovering from injury, the less fit and those who wish to try mountain biking and have been intimidated in the past. One of the newly opened MTB trail sections in the Engadine, that has the Darco and Allegra stamp all over it, is the Bernina Pass Trail which is part of the uber classic 29 mile Bernina Express trail that shadows the UNESCO World Heritage Bernina Express Railway. This is an example of a legacy hiking trail that has been adapted to accommodate both hikers and riders. The full trail, one of the finest trails in Europe starts in Samedan (1721m) near St. Moritz and weaves it’s way up the valley to the pass summit at 2328m before heading down to Poschiavo (1014m). The main section where adaptations have taken place is between Pontresina and the pass summit, particularly around the 20% gradient area above Morteratsch Station. This area has seen separate uphill and downhill flow sections added to take the stress off the shared footpath and to increase rider experience, as well as new singletrack added away from the hikers closer to the pass summit. “We’ve been working on this trail project for two years with a budget of 250,000 Swiss francs [£190,000], the summer is important for tourism and this is an investment for our guests including hikers and trail runners. What was important in this was that we could accommodate all our guests on the trail, and add some downhill bike sections. The feedback from the bike rental shops is very good.” Roland Hinzer, Municipal Council, Pontresina. Interestingly there are systems such as the Hintermann and Weber Method used for scoring the impact of development on aesthetic grounds in protected areas based on visibility, volume, material used and size, but they’re often geared towards large physical structures like ski developments. But similar approaches are now being used in trail development, and should the points score reflect a negative issue this can be balanced out by positive actions. One mistake less informed land managers make is to assume that giving trail builders a small corridor to work in will result in less damage. Narrow corridors can force the building of steep trails following the fall line. As the water funnels down the vertical trail line it gathers speed and power resulting in increased erosion. Many local authorities spend huge amounts of money to put in drains to deal with trail erosion on straight line paths that in the past allowed farmers to get from ‘a’ to ‘b’ quickly. Slowly many are coming to realise that professional MTB trail building companies have the knowledge and skills to re-asses these trails and adapt them alongside bike trails to make them fit for purpose. A holidaying hiker is happier to follow a sustainable path that meanders along a contour line than plough up a straight track prone to erosion. The increased popularity of mountain biking has brought a professionalism to trail building that has largely been overlooked for the past 150 or so years. While road building techniques have evolved along with industrial and urban growth it’s only comparatively recently that research and academic rigour has been applied to the simple trail. This knowledge and thought process is utilised by the crew working on the Albura Trail, especially with the use of a mini digger to alter the grade allowing drainage as operator Christian Accola explains. Previously he worked on bike park projects, using similar skills but with the advantage of being able to alter things if needed. Working on a legacy trail or making a new line in the mountains within the parameters of an environmental assessment means that there are few margins for error. One other disadvantage working in the high Alps is the effect of the weather on work schedules. Once the snows come in the autumn sites are shut down until the spring and early summer. Although as Severin lightheartedly points out it means that the trail can settle and mature under the weight of the snow, just as the wines he was previously involved with would age and improve over time. As Dacro has said, the trail is the key driver of experience but it needs supporting by the services that make life easier for the visitor, and bring a revenue stream for the destinations. This again is where the Swiss have worked together for the common good, bringing those involved together under the banner of herbert.bike, a web portal and print information package that is several notches above the standard tourism department’s token list of hotels and trail maps. It all started around 2012 when the Graubünden regional government began a funded project focused on mountain biking, to develop year round tourism that wasn’t purely dependant on winter sports. This was also partly to future-proof tourism against global and seasonal changes in the weather and climate. It’s not surprising to learn that at the forefront of this project was Darco Cazin. It was initially rolled out as graubündenBIKE, concentrating on infrastructure with signage on trails, development of cyclist friendly ‘Bike Hotels’ and negotiations to allow riding on the legacy trails under the ‘Trail Tolerenz’ banner encouraging responsible and safe riding on shared paths and tracks. As a portal it’s sophisticated with strong branding and visual identity. There’s little to compare it to in the UK, where most destinations have the information available online, but it is often in simple lists with additional links to follow, and without the one stop shop facility to book directly and get any special deals. Herbert brings together the user friendly service offering and identity previously mentioned by Darco. Similarly the best cross country rides are listed as ‘hammer days’, again with suggested schedules. And those unsure of the terrain or wanting to lock into local knowledge can ride with a guide - or ride with a local, as it’s termed. Again these work as deals negotiated by Herbert. Establishing Herbert as the go to website and organisation for mountain biking information has involved a huge amount of work, joining of dots and negotiating some very good deals that make Switzerland a surprisingly good value destination. It shows how seriously the country and particularly the Graubünden region is taking mountain biking. Just as happened 150 years ago when tourism began to develop, it has taken both vision and skills to bring people together and orchestrate positive action. 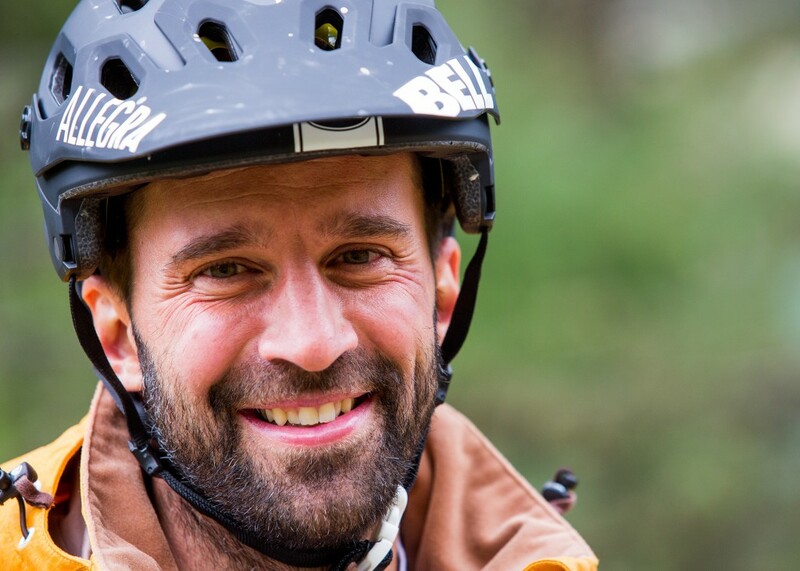 You could say Darco Cazin has been the conductor who brought a sense of harmony and collectivity to the off road biking scene, making junctions and connections so that the Swiss trail network is heading in the right direction. It’s far easier to make progress if everyone is on the same track or singing from the same hymn sheet so to speak. To often development is stymied by organisations working independently of each other, protecting their interests without thinking of the greater good or simply not thinking big. What the Swiss have done is certainly worth celebrating, and who could blame them for blowing their own trumpet, or tuba from on high.